Paleontologists uncovered a strange new dinosaur a few years ago—a crazy, patchwork quilt of a creature dubbed Chilesaurus diegosuarezi. Its bizarre and often conflicting characteristics defied classification, forcing scientists to make an educated guess about its place on the dino family tree. 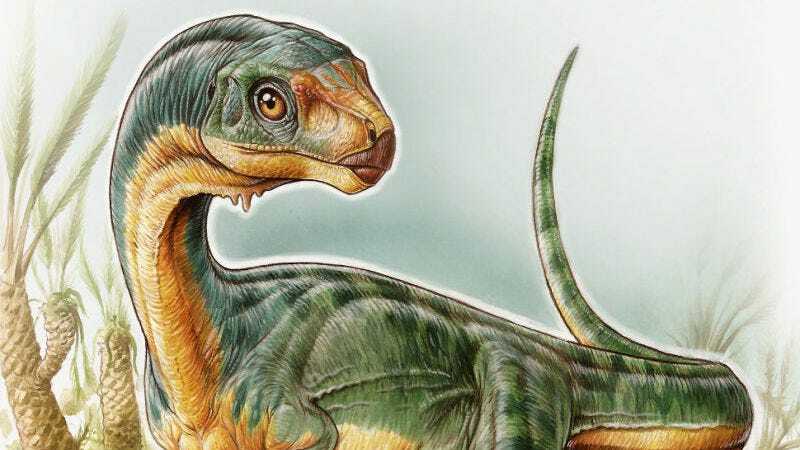 New research suggests the initial attempt to classify Chilesaurus was wrong, and that this animal represents an important transitional species within a different group of dinosaurs. The study, published today in Biology Letters, shows that Chilesaurus is not a theropod, as originally thought, but rather a very early member of ornithischia, a group that includes beaked plant-munching dinosaurs like Stegosaurus, Triceratops and Iguanodon. It may sound pedantic, but this taxonomic reshuffling is a big deal to paleontologists. It means that Chilesaurus, despite its raptor-like appearance, does not belong to a group including infamous carnivores like Tyrannosaurus rex and Velociraptor. Instead, the animal represents a kind of intermediary species somewhere between herbivorous dinosaurs and carnivorous theropods. The new study shows how the divide between these two important dinosaur lineages may have transpired. The University of Birmingham researchers who first studied Chilesaurus decided to slot it in as a theropod, a group also known as the “lizard-hipped” dinosaurs. But the new study, conducted by researchers from the University of Cambridge and the Natural History Museum, suggests Chilesaurus is a member of the “bird-hipped” ornithischia group. Confusingly, however, Barrett says this bird-like arrangement appears to have emerged at least twice independently in dinosaur evolution—once in the common ancestor of ornithischians (as is the case for Chilesaurus) and once within theropods, leading to the origin of birds. Chilesaurus, as the new study suggests, belongs to the ornithischia group of dinos, but it’s still an outlier. Ornithischian bird-hips provided a bodily configuration that was more conducive to complex digestive systems, allowing these plant eaters to travel along a unique evolutionary path. But Chilesaurus, without a characteristic ornithischian beak and with a very raptor-like body, represented an early—and likely transitional—member of this group. It’s not literally the “missing link” that divides ornithischians from theropods (two major dinosaur groups that lived from the early Jurassic to the Late Cretaceous), but its discovery shows how dinosaurs were changing during this important time in evolution. The weird combination of features makes Chilesaurus very difficult to classify, and Barrett says previous ideas of it being a theropod are “totally understandable” as it has many theropod-like features in its anatomy. Matthew Baron, a PhD student in Cambridge’s Department of Earth Sciences and the paper’s joint first author, agrees, saying the original researchers only had smaller, specialized datasets at their disposal, and that they had no way of testing if Chilesaurus was an ornithischian or not. In the new study, Barrett and Baron were able to use a bigger dataset on a larger range of dinosaurs, allowing them to test lots of different positions for Chilesaurus within the dino family tree. “It’s a good illustration of how continuing work and getting more new information can lead us to change our previous ideas,” Barrett told Gizmodo. Importantly, this new study fits in rather nicely with research that Barrett and Baron completed earlier this year, in which the authors argued that theropods are more closely related to ornithischians than previously thought. As their latest study points out, dinosaurs can’t always be slotted easily into the major groups owing to the presence or absence of certain characteristics—the orientation of hips being a prime example. Matt Wedel, a paleontologist and anatomist at Western University of Health Sciences in Pomona who wasn’t involved in the new study, said the authors did a good job of unpacking the results and explaining the evolutionary importance of Chilesaurus. Wedel says this is how scientists come to understand evolutionary transitions, and that new types of animals “don’t spring formed like Athena from the forehead of Zeus.” Rather, they come together a piece at a time as the result of evolutionary experimentation of thousands of millions of years. “If Baron and Barrett are correct, Chilesaurus is sort of the Archaeopteryx of Ornithischia—it has some, but not all, of the characters that we normally associate with the group, just like Archaeopteryx has feathers but still has a lot of primitive features, too,” he said. Archaeopteryx is a family of bird-like dinosaurs that represents a transition from non-avian feathered dinosaurs to modern birds. Wedel also offered some advice for journalists covering this new paper. And if Barrett and Baron and wrong, well that’s good too, says Wedel. The truth will come to light because of further analyses using more data, he says.